South Kansas City was aroused yesterday afternoon to the sound of sirens, police and ambulances. In an upper-middle class neighborhood, five people were shot, three fatally in the quiet of the afternoon. The shootings occurred, if I understood the reports correctly, in five different homes. The five people were victims of a single invader, so we’re told. It is a tragedy and it leads to a number of questions. Could it happen here, where I live? Yes, it could. No neighborhood nor home is invulnerable. Can the police protect me? No. I have no doubt the police desperately wish they could but there aren’t enough to post a cop in every home. The old adage, “When seconds count, the cops are minutes away,” is still true. I live only a few hundred yards from the police station and it would STILL take minutes to reach my home. I don’t like guns, isn’t a phone call to 911 sufficient? No, see #2 above. First, you must have your phone on you, second you must dial 911…and wait for them to answer, and third, you must be calm enough to tell them what is happening. Few people, in a personal emergency, can do all that in the few seconds they have. I have a gun in the house, that should be enough. No, it isn’t. Do you know where it is? How quickly can you get it in your hands? Is it loaded? Many families with small children won’t keep loaded weapons easily on hand. Is it in a safe? Can you open the safe in a few seconds, absolutely in less than a minute? Well, what can I do? Carry a weapon and either keep it within arms reach or on your person at all time. Practice with it, get training in how to defend yourself and how to use your weapon, practice until you needn’t have to think in an emergency, you react. I hear so many women claim, “I couldn’t shoot anyone!” Stop and think of the consequences. Could/would you shoot someone to protect your children? Your husband or family? Some men say the same, with all the usual responses. The actual answer for both men and women is that you will do whatever is necessary to protect your family and yourself—or you and they will die. It’s a harsh statement but that doesn’t change the reality. The world is not safe. It has never been and never will be. We can prepare ourselves for the reality. We can train, teach our family to prepare and train them how to defend themselves and others even if it is nothing more than to train your children to flee and seek protection. Know your neighbors, communicate with them, ask if your neighbor will watch out for you, your children and family, watch your home when you’re away and be a place of shelter if necessary. I carry a weapon. It is something I put on when I dress in the morning, and it is next to me on the nightstand when I go to bed at night. If someone breaks in to my home, I have a weapon within reach in seconds. I am determined I will protect myself and my family. So can you. You needn’t be a victim waiting to be found. If one of those five victims had a weapon close at hand and knew how to use it, perhaps one or more of the others would have remained unharmed. More and more police chiefs and sheriffs are admitting they are powerless to protect anyone. The first responder for your personal defense is you. I wrote an article a week or so ago about the parallels with current events in the Ukraine and China to those just prior to WW2. Obama, like the bungling Chamberlain, is placing the United States into harm’s way and our military is woefully unprepared, undermanned, undertrained and underequipted. The democrats/liberals/socialists have been all too successful in emasculating the US armed forces. President Barack Obama has authorized a State Department request for additional troops in Iraq. Obama ordered approximately 350 additional military personnel be sent to Iraq “to protect our diplomatic facilities and personnel in Baghdad,” according to a Tuesday statement from the office of the White House press secretary. The statement notes that the troops will not be serving in a combat role upon arrival. The Defense Department confirmed that 405 troops will be deployed to Iraq, allowing for 55 military personnel who have been in Iraq since June to redeploy outside of the country and resulting in a net increase of 350 troops on the ground. “This action was taken at the recommendation of the Department of Defense after an extensive interagency review, and is part of the President’s commitment to protect our personnel and facilities in Iraq as we continue to support the Government of Iraq in its fight against the Islamic State of Iraq and the Levant,” according to the White House statement. The numbers being sent are too few to be effective. In reality, all they can be…are targets. There are few good troops in the Middle-east. None of them are in Iraq. But Obama isn’t placing our troops in harm’s way only in Iraq, he’s sending them to the Ukraine as well. (Reuters) – As fighting between the army and Russian-backed rebels rages in eastern Ukraine, preparations are under way near its western border for a joint military exercise this month with more than 1,000 troops from the United States and its allies. The annual exercise, to take place in the Yavoriv training center near Ukraine’s border with Poland, was initially scheduled for July, but was put back because early planning was disrupted by the crisis in the eastern part of the country. “At the moment, we are still planning for (the exercise) to go ahead,” U.S. Navy Captain Gregory Hicks, spokesman for the U.S. Army’s European Command said on Tuesday. NATO stepped up military activity in its eastern member states after Russia’s annexation of Crimea in March, and is expected to agree at a summit in Wales this week to create a new rapid reaction force of several thousand troops. President Barack Obama will visit Estonia on Wednesday to reassure the former Soviet Baltic states of U.S. support, and Estonia’s prime minister on Tuesday called for a more visible NATO presence in eastern Europe. “It is very important to understand that a military solution to this problem is not going to be forthcoming,” Obama told reporters at the White House last week. Once again, Obama is acting, or rather reacting, too late with too little. Our troops in the Ukraine will be nothing more than targets, just as they are in Iraq. The Iraqi government has done something that American federal, state and local governments are forbidden to do. Celebrate Christmas! 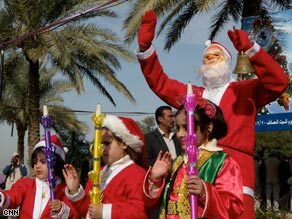 The event takes place in a public park in eastern Baghdad, ringed with security checkpoints. Interior Ministry forces deployed on surrounding rooftops peer down at the scene: a Christmas tree decorated with ornaments and tinsel; a red-costumed Santa Claus waving to the crowd, an Iraqi flag draped over his shoulders; a red-and-black-uniformed military band playing stirring martial music. In an act unseen among other Muslim nations, the Iraqi Ministry of the Interior launched a large hot-air balloon with a picture of Jesus Christ on it with the Iraqi flag flying below it. The story was covered on Hot Air including a video of the balloon. Any similar act by an American governmental entity would have been greeted by a lawsuit by the ACLU (aka the Anti-Christian Lawyer’s Union) or other liberal anti-Christian group. We have brought more freedom into Iraq than we can express in our own country.